What are the Signs and Symptoms of Lyme Disease. What is Lyme Disease? 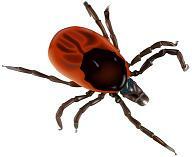 Of the signs and symptoms of Lyme disease, the one to watch for initially is the typical rash. Many people bitten by an infected tick develop the characteristic bulls-eye skin rash around the bite. However, it only appears in 30% of the bites. Some bites will not develop the rash, making Lyme disease hard to diagnose because the signs and symptoms of Lyme disease may mimic that of other diseases. After initial infection, the Borrelia burgdorferi bacterium moves through the area around and below the infection site. As it does so the area of the visible rash (if present) spreads. The infection then moves from the skin cells to deeper cells and organs and does so quite rapidly. Symptoms may often be flu-like and may start any time from 3 days up to a month after infection. There may be tiredness, headaches, sore muscles and joints, and a fever. Some people may not exhibit early symptoms and may not even remember getting a tick bite. It is good to be aware and know if they are in your area. The site of a tick bite, even if there is none of the Lyme-disease causing bacteria, can become quite red and sometimes very itchy. One thing I have heard of people finding success with to stop the itching is the application of tea tree oil over the area. An itch remaining for a long time may indicate something about the state of your immune system. An improvement in overall immunity may help the immune system to clear it up. Lyme disease is caused by a bacterium that is transmitted to humans via the bite of a tick infected with the corkscrew (spirochete)-shaped bacteria B. burgdorferi. Lyme disease is carried by various birds, rodents, deer and ticks and possible mosquitoes and other biting insects. The tick ingests the bacterium from the infected blood of the host, often a deer mouse and then passes it to humans. Lyme disease was first discovered in 1970, is named after the town of Old Lyme, Connecticut and exists around the world. In North American, the tick species responsible for infections are the Ixodes pacificus, Ixodes angustus and Ixodes scapularis. Lyme disease is the fastest growing (tenfold annually) infectious disease in North America, according to the Centers for Disease Control (CDC) reporting in 2006. Only about 4-6 cases per province in Canada are reported annually by the CDC. However, this is likely related to the fact that a positive Lyme diagnosis is only reported to the CDC when a patient tests positive with both the ELISA (enzyme-linked immunosorbent assay) and the Western Blot testing methods. These testing methods, which are used in Canada, produce high rates of false negative results. There are up to 12,000 cases diagnosed annually in the United States.